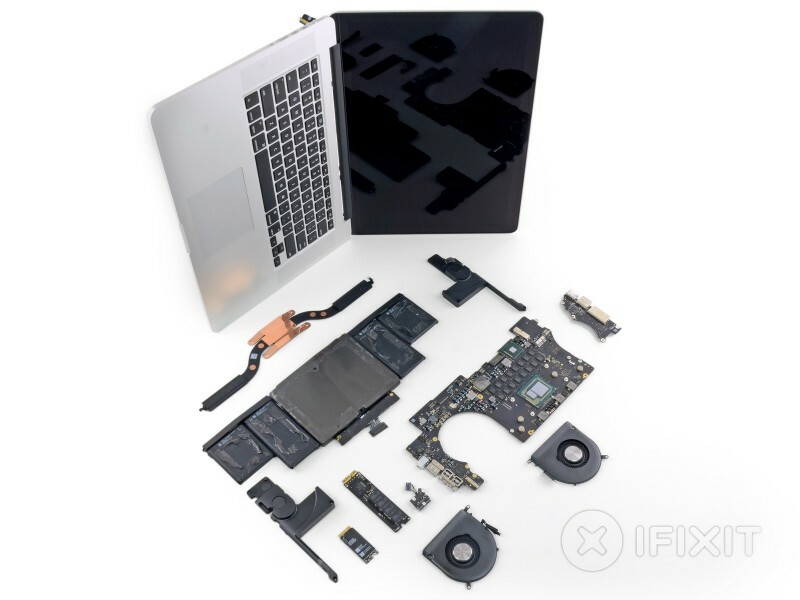 iFixit has performed more of its traditional high-quality teardowns on both the new 13-inch Retina MacBook Pro and new 15-inch Retina MacBook Pro, revealing various improvements to the components of both that enhance performance, but also unsurprisingly make both harder to manually repair. One of the more interesting changes relative to the new 13-inch model is that Apple has apparently reversed its decision to move the 13-inch model's battery away from the trackpad as seen in the previous generation of the laptop, instead choosing to glue the entire battery assembly into the case. This design is very similar to the battery of the original 15-inch Retina MacBook Pro, which was heavily criticized by iFixit for being extremely difficult and time-consuming to remove without puncturing the cells. As Apple stated during its press event, the new 13-inch Retina MacBook Pro now uses faster PCIe flash storage, but is still proprietary as seen in the previous generation and does not allow for easy replacement. Other changes to the new version of the laptop include Intel's i5 Haswell processor and Iris Graphics, the inclusion of only one fan as opposed to two in the last generation, a rearranged cabling system, and a slight update to the MagSafe 2 connector. Meanwhile, the new 15-inch Retina MacBook Pro reveals a similar internal layout to the 13-inch model, but includes higher grade components such as Intel's i7 Haswell processor and Iris Pro graphics. The glued-in battery system and the soldered RAM as seen in the previous generation are also still included, which indicates that no improvements have been made to the accessibility of the new model. 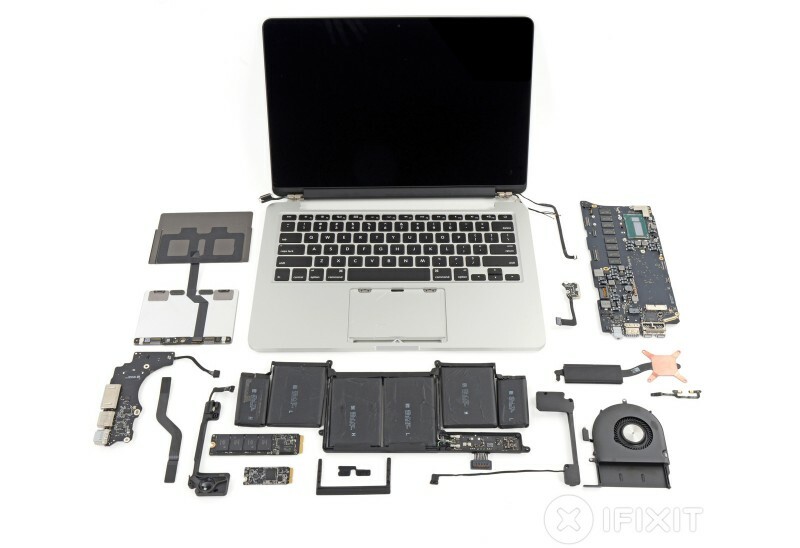 Overall, the teardowns of both new Retina MacBook Pros otherwise yield few surprises compared to the previous models, and the similar challenges of proprietary pentalobe screws, soldered RAM, an integrated display, and glued-in battery system have led iFixit to award each of the new 13-inch and 15-inch models a repairability score of 1 out of 10. Compared to the teardowns of last year's models, the 13-inch Retina MacBook Pro has scored one point lower than the last generation, while the 15-inch MacBook Pro scored the same as the previous model. i am more pissed at the soldered in RAM rather than glued in battery. Many of us don't care. Applecare to the rescue. Yes, if you like paying $1000 a year for owning a computer -- and having to pay 3 years in advance. If your RAM fails in the 4th year, you're lost. The RAM was located on the other side, and you had to take the screws out. Furthermore, if you look at the size of the batteries in even their cMBPs these days, you'll see why they can't have the same level of accessibility. Not justifying it by any means, but I can definitely see how a user-replaceable battery in the newer Mac notebooks can cause more problems than it solves. Is it so hard just to hold the battery in with screws instead of glue? They don't need to include latching mechanisms and quick releases and support structures. Just keep it like it is but put screws there like they did in the 2008-2012 Unibody non-Retina MBP's. I have a 2009 Model which supposedly had a "non-user serviceable battery" and yet I serviced it quite easily by buying the official Apple battery for it, opening my case, whipping out three screws and putting the new battery in and connecting it to the motherboard. It took me literally 5 minutes to do. With these new machines that use Glue there is no way a user is going to attempt it, you could pierce the battery cells or rip through your touchpad cable so this means a trip to local Apple store right? Well I just checked the closest Apple Store to me is 6.8 Miles away according to Apples website so I figure that's not too bad, I check their site for Genius appointments and I get "This store has no appointments available" so I look at the 2nd closest, 11 Miles away. I check their genius appointments "This store has no appoints available". I mean ???? ridiculous. The site doesn't even seem to let you schedule an appointment in the distant future like weeks away from today, it just says there's nothing available with no other options to do anything. btw I also checked local dealers who are authorised to do Apple repairs and on the very first site I checked they say they don't do battery replacements on Retina MacBook Pro's because the battery is glued in so it has to be an official Apple Store for this kind of thing or a very reputable authorised dealer willing to take chances I guess. Apple has no reason to make any parts user accessible. If Apple is smart they will continue to make things harder and harder to upgrade. You're right. And if consumers are smart, they start buying something else that lets them stay independent from one vendor. i'm an engineer (not electrical though), and when i look at pics like that above...it's really quite astounding the amount of brilliant hardware engineering that went into that laptop. Aye, the rest doesn't bother me one bit. But you should always be able to update your own RAM. Diminishing returns though. Lower resale value, lack of upgrades or off-warranty repairs all factor into total cost of ownership when people are choosing a computer. Personally, I just hope Apple sticks with a single PCI-E SSD form factor across the line, so that OWC will be more likely to produce third party storage options. First off let me start by saying I ordered the ultimate version of the 15 inch rMBP, but I would definitely rather have the old 15 Mbp with same updated internals and a blu ray drive. Yep I said it, blu ray!